Renowned investor Warren Buffett once stated that, on average, stock markets rise on two out of every three days. And while that is great news if you own stocks, you might be wondering how do you bet against the market when it falls? In practice, the market doesn’t rise every two days and fall every third day. If only it were so predictable! Instead, it may go on a winning streak, climbing for many days in a row before plummeting lower for a few days. It is during these periods when the market is correcting lower that buying puts can be a powerful options strategy to preserve wealth accumulated during up days and even profit during the gloomy, down days. Some of the richest investors of all time have made fortunes by betting against the stock market, so you will definitely want to get to grips with how to win when markets fall. You may not end up up featured in a Hollywood movie like Michael Burry, who famously bet against the stock market and made a fortune during the 2008-09 crash. But even if you don’t make so much money as to be featured in your own version of The Big Short, you can still arm yourself with the tools needed to stay afloat and even prosper when markets fall. In practice, dozens of strategies exist to bet against the market, but for now let’s share perhaps the simplest one: buying puts. How Are Puts Affected When Stocks Rise? If you are new to options trading, you might be wondering what is a put option? In a nutshell, a put is a contract that gives you the right to sell stock at a fixed price for a certain time period. For example, if you owned 100 shares of Netflix stock and purchased a put option contract that expired 6 months from now, you would have the right to sell your stock at a fixed price anytime between now and then. Even if Netflix crashed to zero during that time frame, you would still have the right to sell your stock for the agreed upon price! And the good news is the power of put options doesn’t stop there. You don’t even need to own a stock to make money with put options. You could simply buy a put option and sell it later when a stock falls without ever owning a dime’s worth of the company’s shares. If you’ve been around the stock market for a while, you have probably heard of the term: shorting stock. When traders believe a stock will fall lower, they can borrow shares and sell them with a view to buying them at lower prices later on. That process is known as shorting stock and is a way to bet against a company’s stock. To bet against Alphabet stock, for example, you would short Alphabet at the current share price in the hopes that, when the price fell, you could buy it back (buy-to-cover is the terminology used) for a profit. The kicker is if you are wrong, you risk losing a lot of money. In fact, the higher the share price goes the more you lose when shorting stock. So when making a choice between buying puts vs shorting stock, the former is often preferred because the risk is limited. In fact, the most you can lose when buying puts is the amount you pay for the puts. Most good brokers these days can handle trading requests to buy put options but if you want a combination of knowledgeable support staff, competitive commissions costs, and fast order execution, the best options brokers are your best bet. TastyWorks and thinkorswim are among the very best brokers for options trading. Whether you are a newbie or an experienced options trader, these trading platforms have the tools, education, and trading communities to get you started on the right track to buy your first put option contracts. No matter which options broker you choose, the process of buying puts is similar. Each put purchase begins with a Buy to Open order. For example, if you are betting against XYZ stock, you could buy to open 1 put contract of XYZ at strike 75 for say the month of January. Let’s pretend it costs you $2 to purchase the put option and by January’s option expiration date XYZ shares are priced at $65. Your put contract would be worth $10 now, the difference between the strike price, $75, and the share price, $65. Because you paid $2 for it and it’s worth $10, the profit from buying the put option is $8 per share. All you need to do is place a Sell to Close order to exit the position. And because each options contract is equivalent to 100 shares of stock usually, this means you made $800 in profit after spending $200 upfront to buy the put option. In the example above, a decline in share price resulted in an amazing 300% profit in a short time period. But it’s not all smooth sailing when trading options. When stocks rise, put options are usually negatively affected. There are some exceptions to the rule that we won’t dive into here but a good rule of thumb is to equate rising share prices with losing money on put options you bought. How much can you lose buying puts when stocks rise? In a worst case scenario when a share price rises high enough, you can lose the entire amount you paid for the put options. In the example above that would be $2 per share. And because options are bought in contracts that translates to $200. Clearly, the risk of losing 100% of the money you spent buying puts is sufficiently high that you should tread carefully when first buying put option contracts. In fact, the top options trading platforms like tastyworks and thinkorswim provide practice areas, called virtual trading platforms to allow you to dabble and get to grips with various strategies risk free. Although the prospect of losing 100% of the money you paid to buy puts seems scary, the reality is the amount you can lose is capped. Unlike shorting stock, where the risk is theoretically unlimited, the risk when buying puts is fixed to the amount you forked over at the start of the trade. Imagine two traders who wanted to bet against Amazon stock during a time when it had run up a lot. Assume one trader shorts Amazon stock while the other trader buys put options against Amazon stock. Now let’s further assume both traders are wrong and the stock keeps powering higher. For every dollar the stock rises, the trader short Amazon stock will lose $1. However, the trader who bought puts can lose no more than the price paid for the put option contracts, irrespective of how high the stock rises. 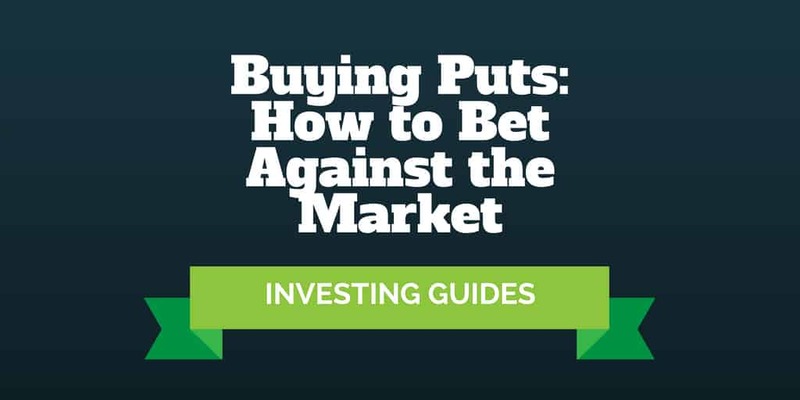 If you have been around the stock market investing block for a while you may have stumbled across another method to bet against the market: selling calls. Like buying puts, selling calls is a way to profit from declining share prices. But that might be where the similarities end. When you compare the bearish strategies of selling calls vs buying puts, the latter method is much more attractive on key criteria like risk and reward. Whereas buying put options will continue to make money for you when share prices fall ever further, selling calls results in a limited profit potential. And while the most you can lose buying puts is the amount you paid for them, the potential for loss when selling calls is significantly higher. As a stock goes ever higher, losses continue to mount when selling calls just as they do when shorting stock. Selling calls alone is considered a fairly risky strategy because of the limited reward yet unlimited risk tradeoff. However, when you own stock and sell calls against the stock, you create a covered call strategy, which is one of the most powerful options trading strategies to generate cash flow. When you expect a downturn in the stock market, you have lots of bearish strategies to choose from, including buying puts, selling calls, and shorting stock. Lining those strategies up against each other, buying puts ranks among the best ways to bet against the market. Unlike shorting stock and selling calls, which expose traders to ever more risk as share prices rise, buying puts limits risk to the amount paid upfront for the options. And in contrast to selling calls, buying puts enables traders to continually profit as share prices go ever lower, so the reward-to-risk profile is much more favorable. Before pulling the trigger on buying puts, make sure to practice using a virtual trading platform, like the ones available at thinkorswim and tastyworks. And keep in mind that over time, markets rise more often than they fall, so bearish bets are best used judiciously when the odds of market declines rise in your favor. Check out this article to see when a stock market crash may be more likely to take place. Or if you like to trade over shorter time periods, these books on technical analysis may be the leg up you need to improve your stock market timing. >> Which Options Platform Is Best: thinkorswim vs tastyworks?